Hi I知 Amy, I知 19 and I live in Somerset England. 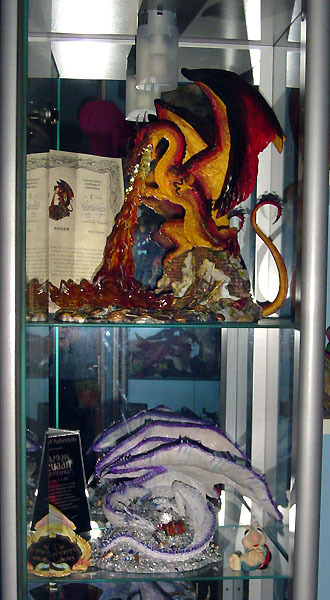 I first started collecting dragons when I was around 15. 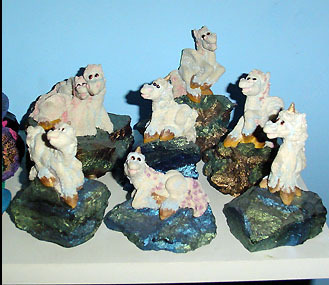 I saw some Tudor Mint Land of the Dragons figures in a local shop and brought a few. At 15 with paper round money of ｣15 a week if I was lucky, one or two was enough from mums point of view. Well eventually one or two grew as they do and I ended up with about 30 or so! Then I stumbled across Ebay and found Enchantica, looking at Enchantica I found Marvs fantastic super duper stunningly amazing website and the Enchantica chatty page where I just started talking to people. 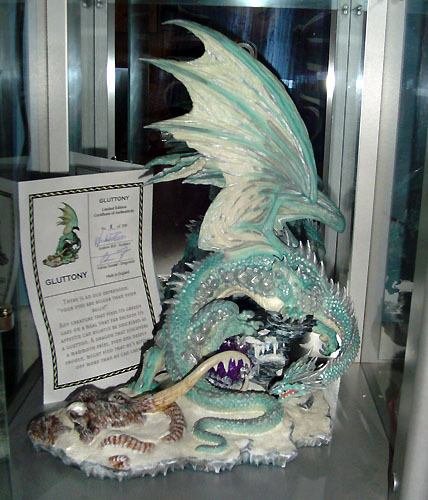 People being Adrian and hey presto we find Thedragonsite.com Well I love Andrew Bills Dragons so I started collecting Dragonsite pieces. So far I have all the VerbuMMagus pieces as well as a Pink Onslaught, Green Aura and an early grey version of thief that I love! I managed to pick these up over the last few Dragonsite events. 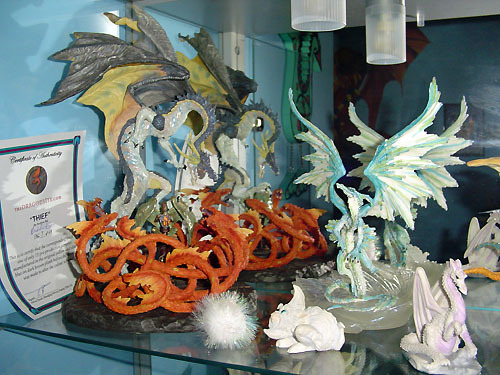 I also collect Thedragonsites other ranges Nene Thomas Faeries and Andy痴 Bookwyrms and of course the Sins!! Gluttony has got to be my favourite so far but Pride and Anger are AMAZING!!!!!!!! Ok I don稚 actually live off a paper round now, I have a weekend job, which gets me a fair bit more. I can be found all the time on the Dragonsite or Marvs chat page on thesorcererslibrary.com I知 also lucky enough to have a Multi-coloured Marauder from Andy Bill, you can think what you like but I love him, that痴 the dragon by the way. Also my Fantastic Yeuaan from Rob Simpson, which I adore. THANKS ROB! 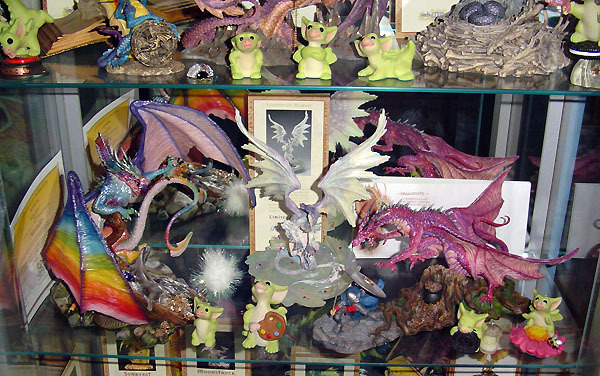 I have a very small collection of Carol Lynn Penny痴 dragons, I知 trying to build up a collection of her Exodus Dragons, Unicorns and Pegasui (Carols word for Pegasus痴). I have a few of her genesis pieces as well and I am collecting her new Draggles. 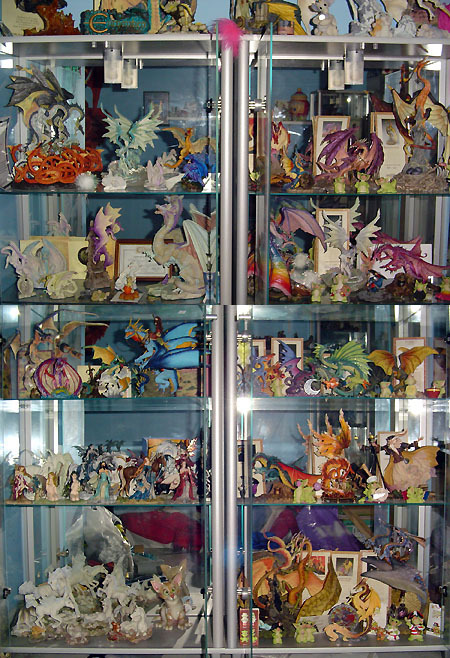 I also have a few Pocket dragons my Dragonsite cabinet got invaded! There is also a shelf of fables, which I am rather fond of. 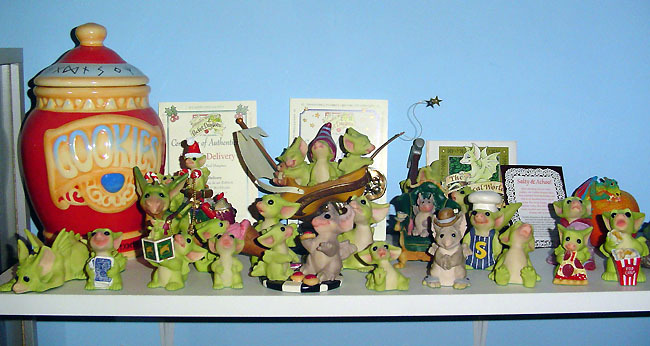 I have an awfull lot of 'stuff' in my room most of it is dragon related. 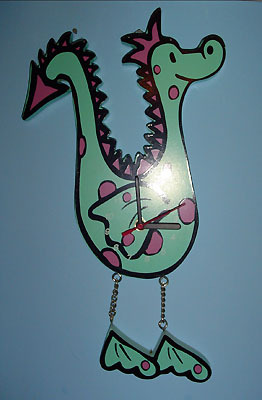 Ive got this fab Dragon clock which i personally think is super cute and lots of artwork and prints all over the walls. 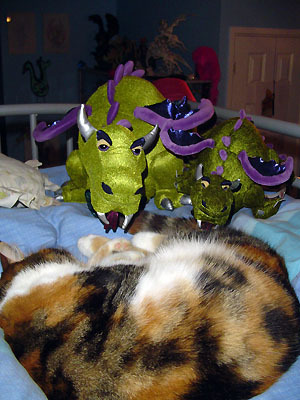 I just love my two dragon soft toys! (Sir Nigel Terragon and Master Clifford Tarquin Terragon) DONT ASK! They are meant to guard the bed but don't do a very good job. So that痴 basically it really, a bit about me? ok. Well as I said I知 still at college, I have just finished my A levels but I am staying on another year to do a foundation in Art, hopefully off to University in 2007 to do a fine Art Degree. I go gliding with my dad at the weekends when I知 not working. Currently a Solo glider pilot and its so much fun, I love that adrenaline rush! In the future I would like to get an aerobatic licence and I値l continue flying. I would quite like to do some sort of Art restoration as a job.